Following on from our last article which introduced the European Court of Human Rights Application by Equal Love campaigners in the United Kingdom, here we introduce Northampton-based couple Scott Maloney and Matthew Toresen. 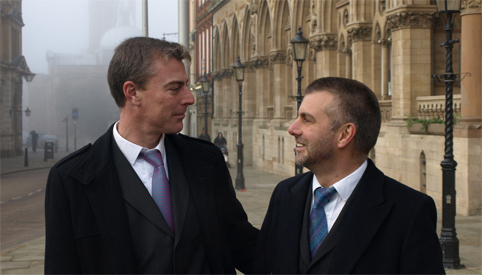 Scott and Matthew were the third couple of the eight to challenge the twin bans on gay civil marriages and heterosexual civil partnerships in the United Kingdom. What follows is an intimate insight into the couple’s relationship and their involvement in this historic initiative. Matthew whose parents worked for the Foreign Office, was born in Tripoli, Libya and raised in various countries around the world. He studied Zoology at Reading University and had a variety of jobs in Reading, London and Nottingham before moving to Leeds in 1991 to start work at Yorkshire Mesmac – a Gay and Bisexual men’s sexual health project. The couple have been together for nineteen years and, like many couples, they met through work; Scott was a volunteer with Leeds Aids Advice which shared a building with Yorkshire Mesmac; where Matthew was a worker. Their paths crossed on an almost daily basis and a friendship developed. They told me, “We had a lot of interests in common – natural history, ecology, science, travel, art and HIV politics. Over time, this friendship developed into a relationship. Over the years there have inevitably been ups and downs. In the late 90’s we separated for a while. However, we were always in touch and we soon realised that we were happiest when we were together”. Both Matthew and Scott have been involved with various equality advocacy initiatives prior to taking part in the Equal Love Campaign; this has included, in the past, both professionally and personally, ‘Stop The Clause’ (which challenged Section 28 of the Local Government Act 1988, the controversial clause which stated that a local authority “shall not intentionally promote homosexuality or publish material with the intention of promoting homosexuality”), ACT UP (the international advocacy group working to impact the lives of those living with HIV/AIDS), and importantly, living authentically and visibly as ‘out’ gay men. They explained, “We both had fairly comfortable middle-class upbringings and it is fair to say that the self-realization experienced during ‘coming out’ brought wider equality issues into focus. These were further underscored in our later working environments where we were fortunate enough to meet and campaign alongside passionate and committed people. Matthew has known Peter Tatchell for many years and received the original email looking for couples interested in what would develop into the Equal Love campaign. This chimed with conversations that we were already having between ourselves and after discussion, we contacted Peter to say we were interested”. Their part in the campaign proved challenging, more so than for most of the other couples. 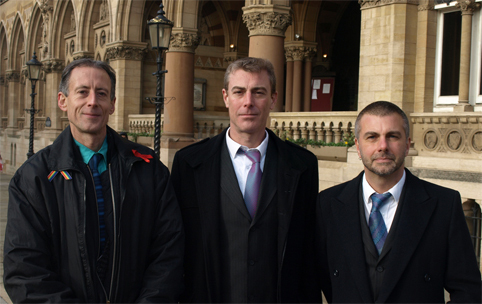 In order to receive a letter rejecting their application, a document which would then be used as evidence of discrimination when the case was presented to the European Court of Human Rights, Matt and Scott first had to book an appointment with their local registrar. Matt and Scott told me of these difficulties, “Initially, booking the meeting with the Registrar was not as easy as we had hoped – they wanted full names and we needed to have pre-booked the eventual marriage venue and the Registrar who would marry us. At no point did they ask for the gender of the participants so for booking purposes, the only change we made was that Matthew became ‘Em’. Toresen”. Both Matthew and Scott are very experienced in dealing with the media and were relatively happy to be spokespeople for the campaign. They also acknowledge that the positive reactions so far have reinforced this. I wondered if there was any apprehension regarding the potential high level of media interest and was told, “we knew there would be press interest and, in fact, both local television stations wanted to film us at home in the morning getting ready to go to the registry office. We turned this request down – it felt too much. Pleased at the level of media interest generated, but having had experience of the press in the past, we were anxious about how they were going to report it – was it going to be a ‘hatchet job’? For this couple, an important part of the campaign has been to emphasize that Equal Love is about giving everyone more choices about how their relationships are recognized and that this is not simply a Lesbian and Gay issue but rather a human rights issue. Matthew and Scott are of the opinion that wanting to get married is “an overtly political act – forcing people to recognize that we are actually in a relationship rather than just ‘friends’ or ‘companions’. We are sure that this may be uncomfortable for some people who find it easier to compartmentalize us in a non-sexual way”.